I’m seriously SO excited to be participating in the giveaway of 2 Melissa & Doug Trunkis in support of The Heart Project, a fundraiser for the American Heart Association! If you know of anyone who’d love a Trunki, be sure to enter this wonderful giveaway! Thanks so much Melissa & Doug for supporting The Heart Project! Here's more information about The Heart Project eBook and Printed Book if you haven't checked it out yet. There are 4 Trunki and Teddy Bear auctions going on right now too! 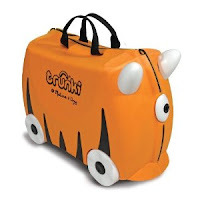 Some other reviews about the trunki can be found here. So... are you ready to enter? Check out the deets below. Have you supported The Heart Project by donating to the AHA or getting The Heart Book? Support The Heart Project from now until Valentine’s Day. Every $5 donation to AHA will receive a FREE eBook version of The Heart Book. There are OTHER ways to enter too … You are not required to donate in order to enter in any of these giveaways. Enter using the Rafflecopter widget below. If you do not see the Rafflecopter entry form below, please enable or update your java script. Enter now until February 14! * This promotion is in no way sponsored, endorsed or administered by, or associated with, Facebook. We hereby release Facebook of any liability. Winner(s) will be contacted by email 48 hours after the giveaway ends. If you have any additional questions – feel free to send us an email! * No purchase is necessary to win. * Winners will be chosen via random.org by 2/14/12 and will have 48 hours to claim their prize. If winner does not claim prize within 48 hours or forfeits, prize will be redrawn by random.org and the new winner will be notified. thanks -- would love to win! Thanks for the giveaway! Great job AHA keep up the good work!